There are lots of decisions to make when you become a parent. If you’ve decided that you want to carry your baby rather than rely on a stroller, it’s really important that you find the best baby sling wraps. To help you and your baby stay comfortable, we researched some of the most popular and best-selling products to put together our reviews. But before we get started, let’s take a look at some of the features you need to know. Sizes: This varies widely and really depends on the style of the carrier. Most true wrap carriers are one size fits all but there are some other styles here that range from XXS all the way up to plus sizes. Weight Limit: Most of these carriers are newborn ready, though be cautious with a preemie. 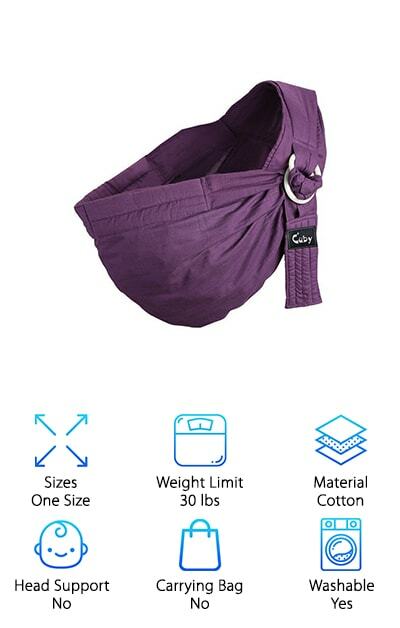 It’s no fun to carry a toddler around so getting a sling that can hold upwards of 30 pounds will make life easier down the road. Material: The majority of these wraps are made of a cotton and spandex blend. This is a great fabric for this purpose because it’s soft and has some stretch to give your baby a little more support. Head Support: Speaking of support, there is no “technical” head support in any of these carriers. It’s really up to you and how you tie the wrap and position your baby. So, they can have head support when used correctly. Carrying Bag: A carrying bag isn’t really going to make any of these wraps more or less effective. But it is a nice thing to have if you need to pack up your wrap and take it anywhere. Machine Washable: Babies can be messy. No, let’s rephrase that. Babies are messy. It is essential that your carrier be machine washable, bonus points if you can throw it in the dryer. It saves you from a lot of bad smells. Now that you know a little more about what to look for in the best baby sling wrap, let’s get right into our reviews. Here’s the deal: if you’re running short on time, look at our top and budget picks first. They’re the first 2 items on our list and will give you an idea of what to expect. All of these products are awesome, though, so you should definitely stick around if you can. Ok, let’s go! Our top pick for wrap around baby carrier comes from Baby K’tan. The thing that we love the most about it is you get the feel of a sling wrap without having to worry about the wrapping part. This Baby K’tan carrier is ready to go right out of the box. It easily slips on like a tee-shirt and adjusts without frustration. You get the look and all the benefits of a true sling wrap baby carrier without having to figure out the tricky wrapping part. 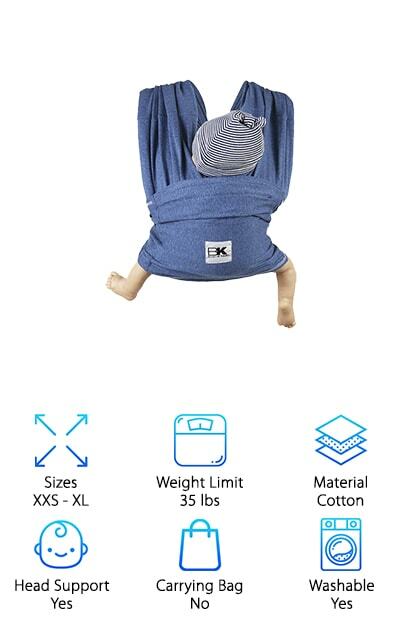 Plus, you can easily switch between carrying positions which makes this a great carrier for your newborn that will last through the toddler years. Here’s the best part: it’s been recognized by the International Hip Dysplasia Institute as a hip-healthy product. This is our budget pick, the Innoo Tech Baby Sling Carrier. It’s definitely the best baby carrier wrap for the money. This is a true sling baby wrap that’s a 4.5 meter long piece of a soft French Terry. That’s 95% cotton and 5% Spandex so it’s soft and comfy while still having some stretch to it. 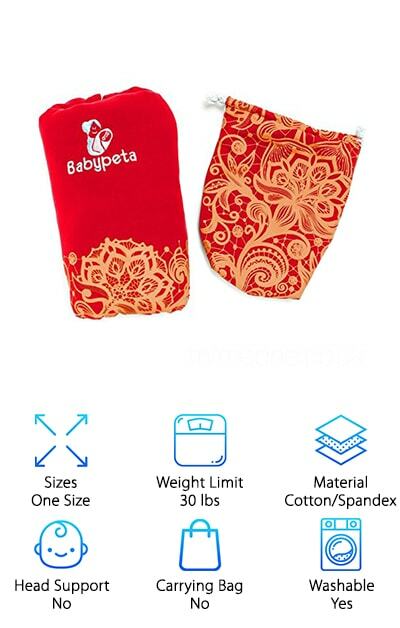 Best of all, it’s more and a half meter wide so provides a lot of support for your baby. If you’re overwhelmed with having to learn how to tie it so it gives you and your baby the proper support, don’t worry! It comes complete with an informational DVD that will show you exactly how to make it work. Plus, it’s machine washable and you can throw it right in the dryer. The Boba Baby Wrap is the best baby sling for breastfeeding because it lets you do an infant hold, wrapping your baby and holding them close to you in the perfect breastfeeding position. 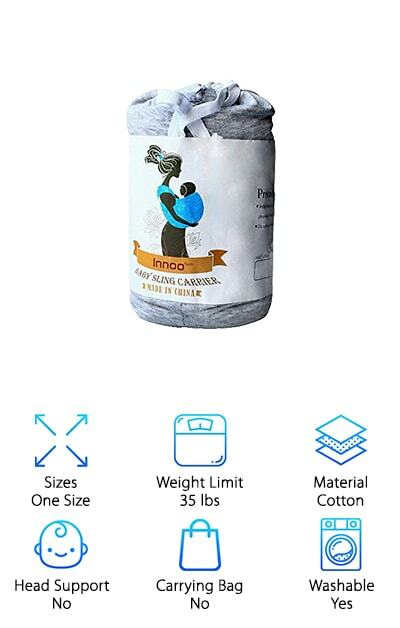 Of course, you can use this wrap all the way through 18 months of 35 pounds so this is also a baby carrier that will grow with your little one. There are no buttons, buckles, rings, or snaps. It’s 5 ½ yards of soft, cotton spandex blend so it has just enough stretch to for the right amount of support. If you think you’re going to need help learning how to wrap and tie it, never fear! They include a photo-filled instruction booklet so you can make sure you get it right, every time. It’s a safe, hands-free way to keep your baby close. 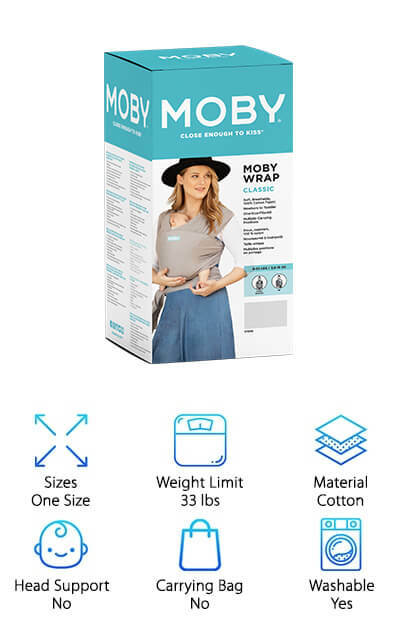 This cloth baby carrier wrap from Moby is made of 100% cotton. It grows with your baby, too. In fact, it can hold up to 45 pounds so it’ll be good well into the toddler years. There are front and hip carrying options so your baby will be happy at any age. The way the wrap distributes the weight across your back and shoulders is what makes it so comfortable for you. The stretchy cotton and versatility make it comfortable for your baby. Wear your baby facing you, sideways, on your back, or facing the world depending on their development. There’s a handy instructional guide that will show you the various ways you can use the Moby sling for various ages. Best of all, it’s machine washable. A very important feature for any baby product. When researching the best baby sling for newborn, we had to include the Cuddlebug Baby Sling wrap. It’s easy to carry your baby hands free when you have a wrap like this. And here’s the kicker: it comes with a lifetime guarantee. This one size fits all wrap is made of French Terry cotton and Spandex, the perfect blend of softness, convenience, stretch, and support. You can use this wrap in a lot of ways. Of course, it’s a great baby sling carrier. But you can also use it as a nursing cover if you’d rather breastfeed with your baby unwrapped. 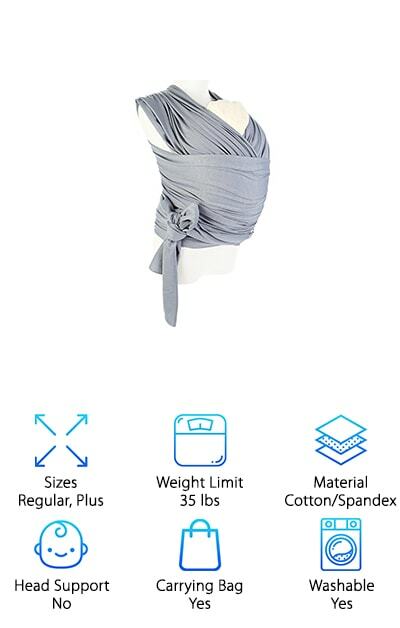 You can also use it as a postpartum belt if you need some support while you’re recovering after having your little one. And here’s the kicker: it comes with a lifetime guarantee. This sling carrier for baby from Baby Womb World is a little different than the wraps we’ve seen so far. Why? Rather than consisting of a long piece of fabric that you wrap, this one has a bit more structure. Instead of tying it around your torso, this wrap is more belt-like. There are rings to thread the end through to secure it just over your shoulder. It’s easy to adjust, and don’t worry. It’s strong and supportive. One of the cool things about this carrier is that it lets you carry your newborn in a position that’s similar to how they were in the womb. The wrap can be used all the way through the toddler years, up to 30 pounds. The cotton spandex blend is soft, elastic, and best of all, machine washable. There’s a lot to love about the Babypeta Baby Wrap but we have to say, it has the best baby sling pattern we found in our research. This isn’t a plain baby sling in a muted color. In fact, they were specifically designed to be a little more stylish. There’s more to them that looks, though. They were also made to last. The edges are folded over and hemmed instead of being left raw like some of the other wraps out there. Plus, the printed designs won’t crack or peel and are rated to last at least 100 washing machine cycles. And get this: the fabric is super soft and helps reduce any discomfort from rubbing against your skin. Oh, and one more thing: it also comes with a lifetime guarantee. Another awesome choice for baby carrier wrap is the DaisyGro Baby Sling. 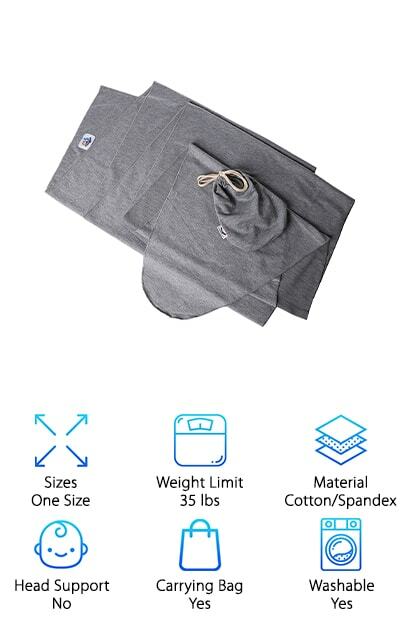 It’s made of the perfect blend of soft cotton and stretchy spandex. It’s soft with just enough stretch to give you and your baby the support you need. There’s no straps or buckets, just a long piece of fabric. And when we say long, we mean it. The regular sized one is 17 feet and the plus-sized is 19.6 feet. So, it’s safe to say that this wrap will work with parents and caregivers of all shapes and sizes. 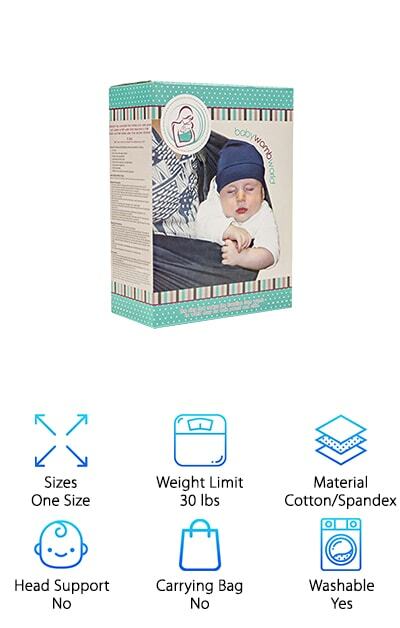 It works with babies of all shapes and sizes, too, from newborns and infants all the way to toddlers up to 35 lbs. And don’t worry if you need help figuring out how to wear it. There are plenty of instructions available! The Baby Hugs Carrier Sling is one baby carrier sling that is really comfortable to use. The fabric is super soft and just a little bit stretchy. 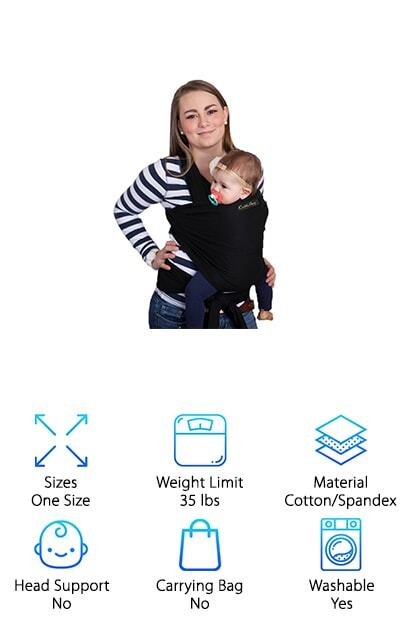 It distributes the weight of your baby over your back and shoulders so that carrying them is a breeze. This is a one-piece fabric wrap that has no rings or buckles. It’s also pretty versatile. You can use it as an awesome cloth baby sling, a maternity belt, a postpartum support belt, a nursing cover, or even as a baby swaddler. It’s also rated for up to 35 pounds so this one will take you and your baby all the way through early toddlerhood. This wrap comes with a carrying bag and an instructional booklet to help you figure out all the different uses. 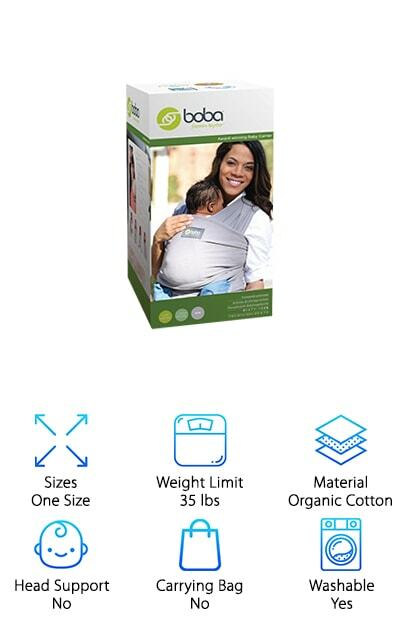 Kangaroobaby has a best baby wrap carrier that was specifically designed so you can carry your baby in the same way they were positioned in the womb. This sling has a loop where you secure the carrier over your shoulder. When your baby is an infant, they can be in a side-lying position while you carry them. It’s great for breastfeeding, too. As they get older, it also makes a great toddler carry for kids up to 30 pounds. This carrier can be adjusted to fit most body sizes in seconds. It’s made of premium combed cotton which is not only machine washable but also fast drying. If you want a carrier that isn’t the usually light neutral color, this one is available in 5 different bright options: pink, blue, purple, yellow, and cream.